The award winning fine dining Indian Restaurant, Rang Mahal at Pan Pacific Singapore has launched a brand new menu, reinventing Indian cuisine with a modern spin on Indian classics. 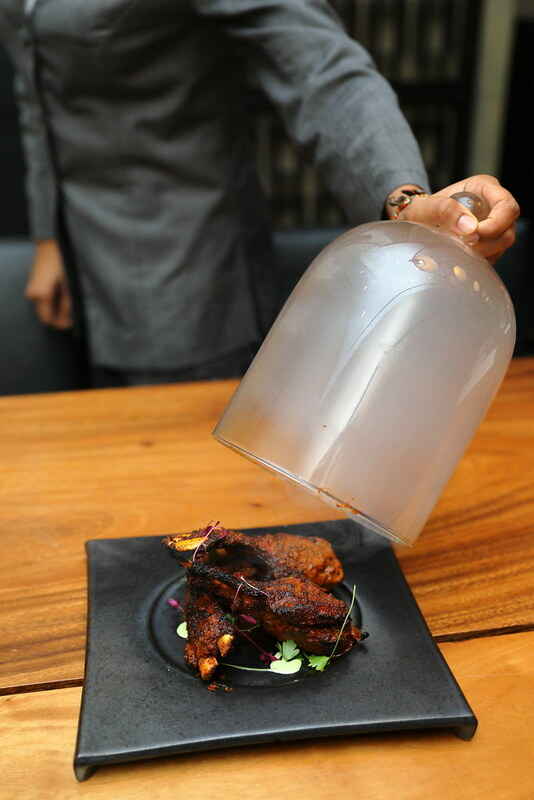 The new menu is put together by their new award-winning Chef Milind Sovani, who has returned to Singapore after leaving his previous role in an award winning Indian restaurant in Singapore to explore the various regions of India for the past five years. I really got a glimpse into Rang Mahal's interpretation of modern Indian cuisine from the Amuse Bouche. I never knew Indian cuisine has reached a stage of such refinement. 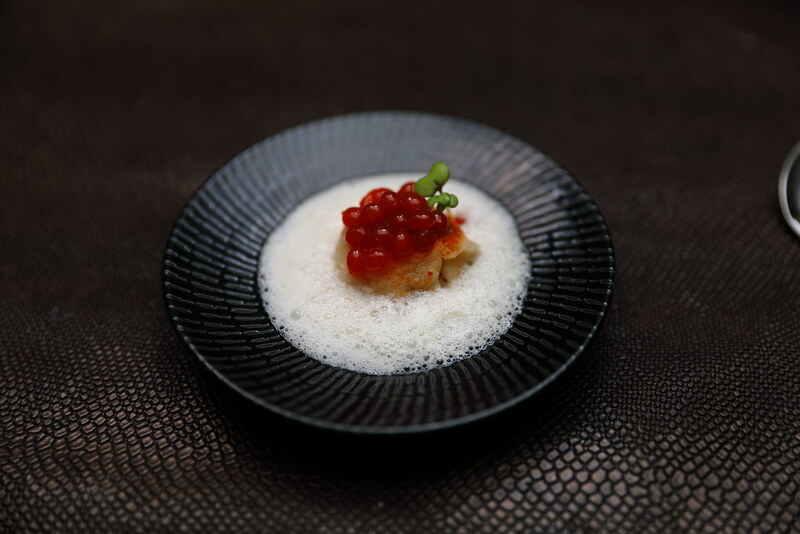 The little red roes are actually chutney caviar while the foam is made from yogurt. We started with the Tomato Saar, Mulethi Herb Foam ($20). The type of tomato soup I knew is thick and creamy but the version here is light and airy. 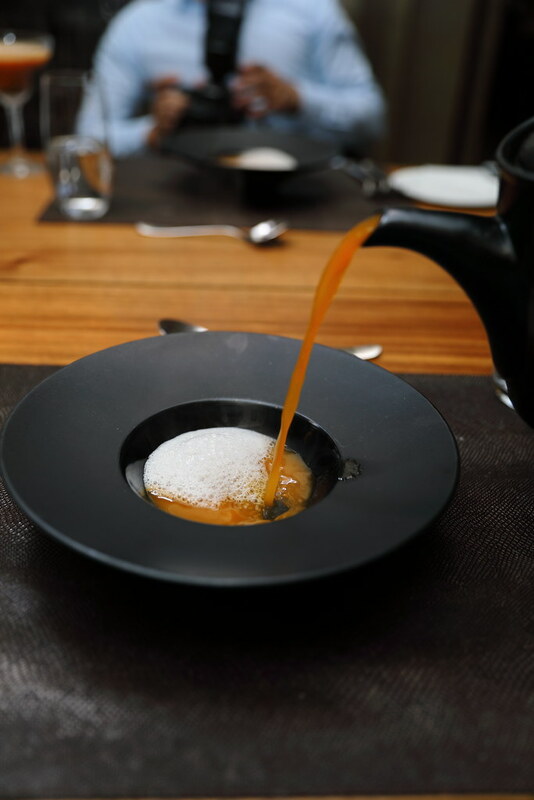 The tomato soup is poured over a dollop of mulethi (liquorice root) foam which boasts antioxidants as well as medicinal properties that help to cure sort throat, cold, cough etc. 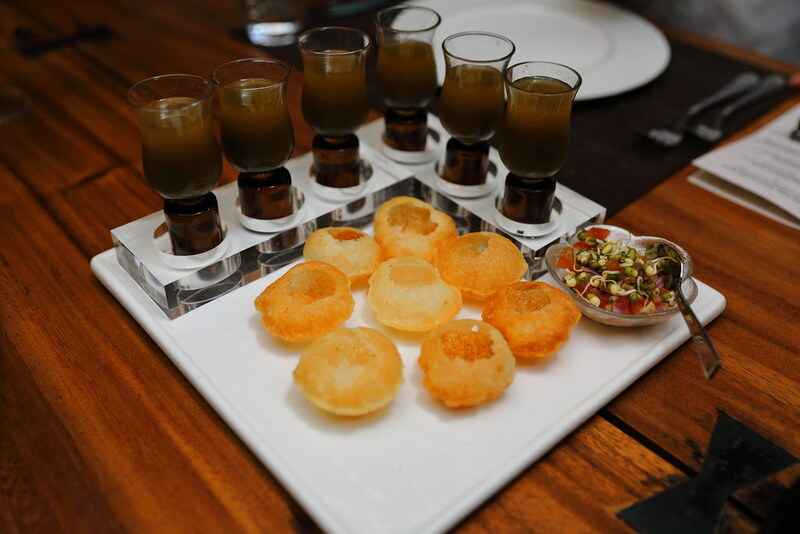 A delightful and fun dish is the Bombay Pani Poori ($25) which consists of crispy semolina puffs served with stuffing (moong bean sprouts, onions, chillies) and spiced water (blend of chutneys, spices and herbs). Diners can have fun stuffing the moong bean sprouts into the poori and then pour the spiced water into it. Have it in one bite to get an explosion of flavours. The Roomali Masala Papad is probably the biggest papad that I have seen, as big as a whole wok. 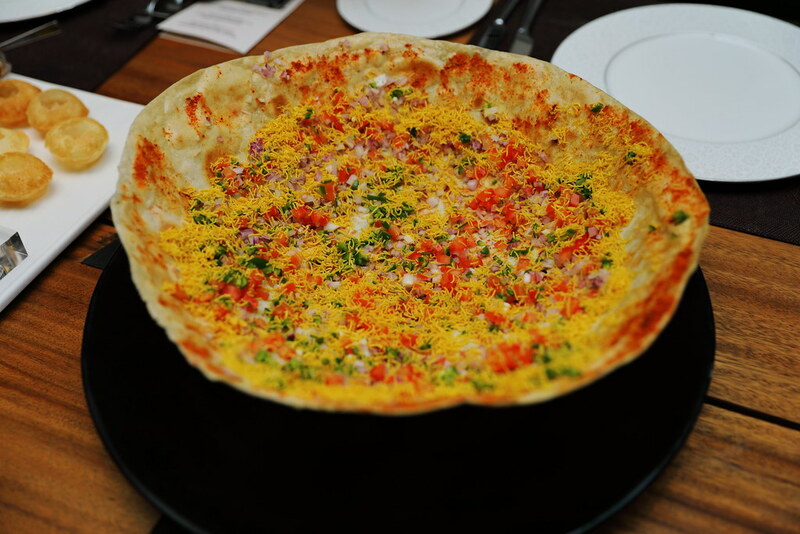 This is the part when you need to get your hands dirty, tearing the gigantic papadum apart which has been topped with lentil crispies, onion, tomato, chilli, sev and special spice blend. While I enjoyed the crispiness of the papad, I felt that the onion flavour comes across a bit too strong. A vegetarian dish on the menu is the Tandoori Duet of White & Green Asparagus ($35). 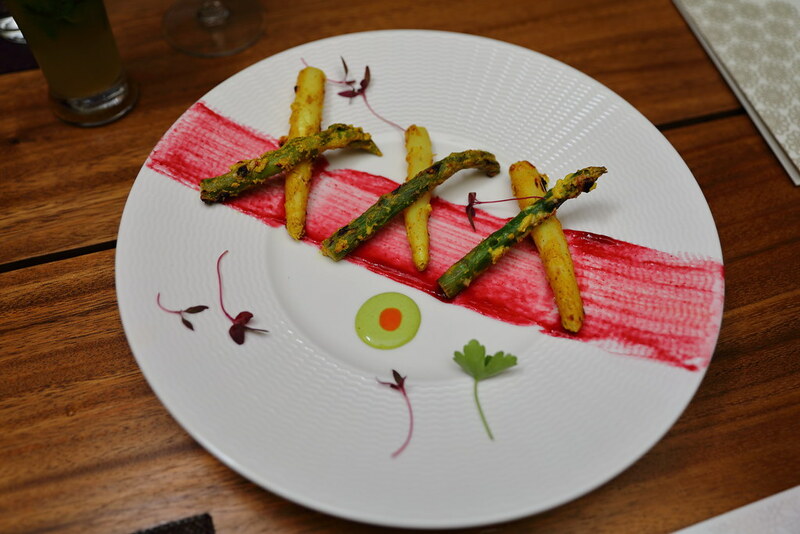 The white and green asparagus are lightly grilled in tandoor. This is paired excellently with the red beetroot sauce, yellow mustard sauce and green mint sauce. 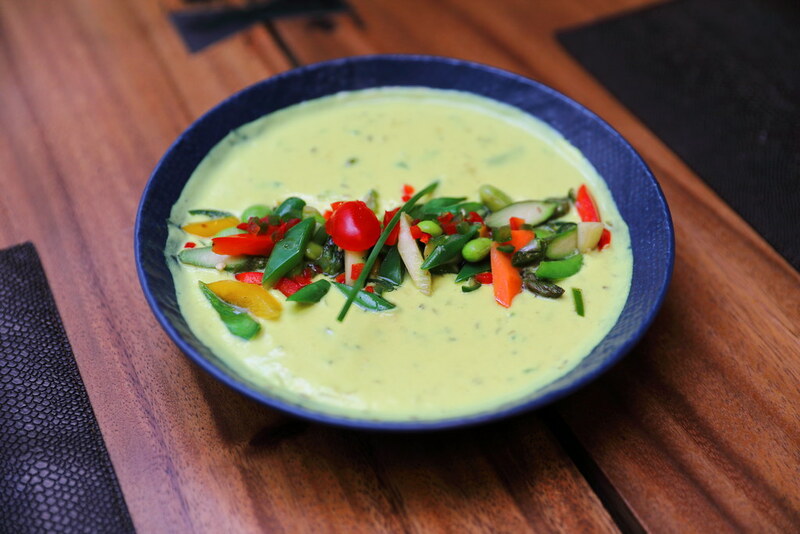 Another vegetarian dish is the Subz Moilee ($36), a southern India dish that features an assortment of vegetables in a rich, creamy, Kerala-style coconut curry. This goes very well with a plate of white fragrant rice. 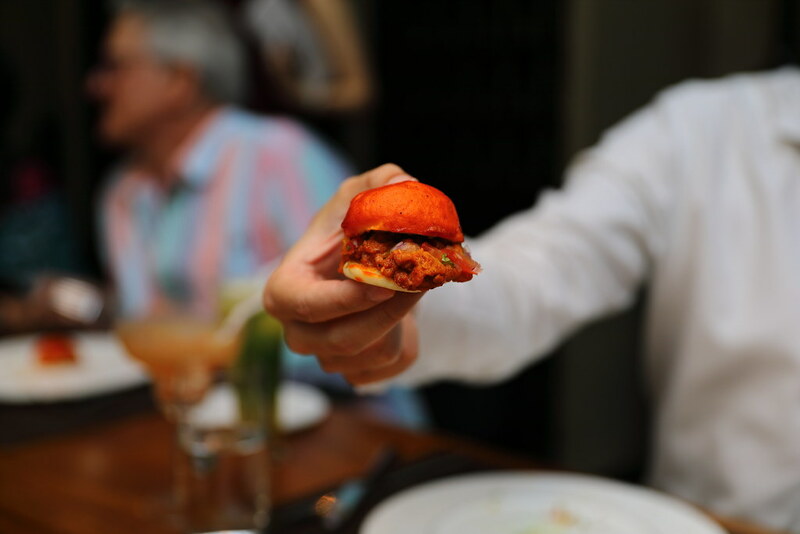 I thought the Butter Chicken Bao ($42) is rather innovative. Adopting the dim sum form and using the Chinese bun, this has transformed into another way of appreciation the classic butter chicken. It brought a change as well as the stereotype perspective of Indian cuisine. 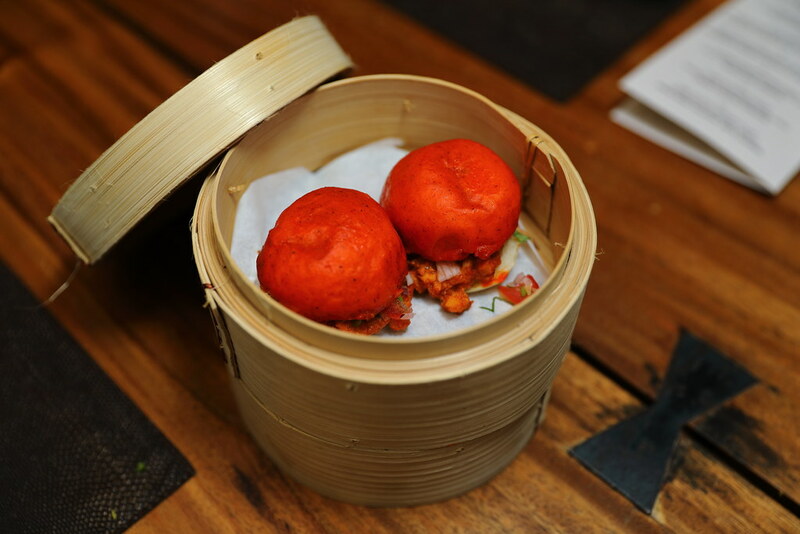 While the butter chicken bao is influenced by Chinese cuisine, the Tandoori Fondue - An Ensemble of Kebabs ($58) takes a Western approach in a fun way. 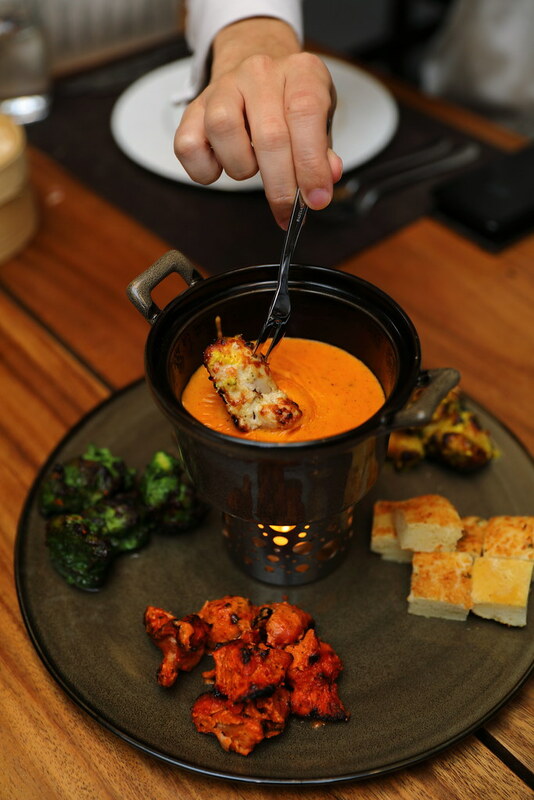 The chicken kebabs are marinated with holy basil, kasuri fenugreek, cashew cheese and Punjabi chicken tikka and presented in a fondue style for some dipping fun. One of my favourite dishes of the night is the Dhuwandaar Lamb Chops ($42). I enjoyed the beautiful aroma of the special spice blend along with caramelised pineapple and ginger garlic marinade that is rubbed onto the Australian lamb rack. This is further accentuated by smoking it with garam masala and applewood for a sweet overtone. A very hearty traditional dish from Mumbai is the Parsi Kheema Per Eeda, Maska Bao ($55) that boasts a Parsi twist. 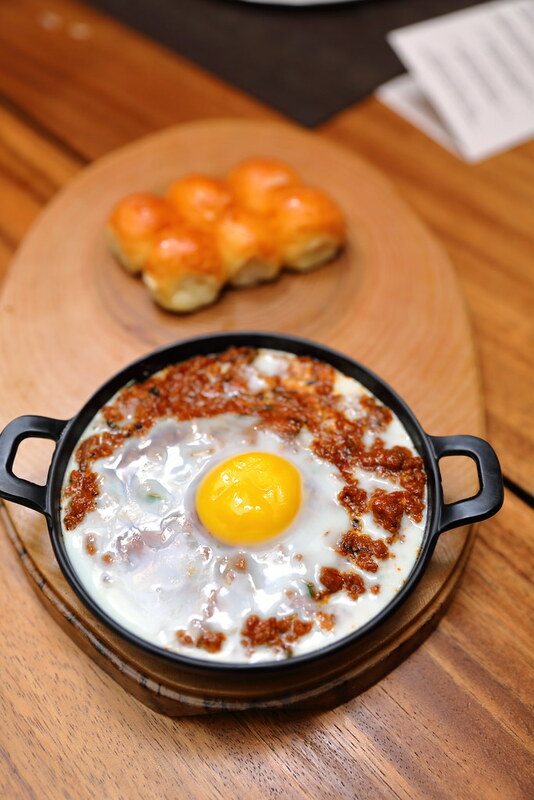 It features spiced minced lamb (kheema) with soft eggs and buttered (maska) buns. The best way to enjoy this is to tear the bun apart and stuffed the kheema and eat it like a sandwich. The Gulab Jamun Flambe ($25) is served flambe style with Drambuie liquor. 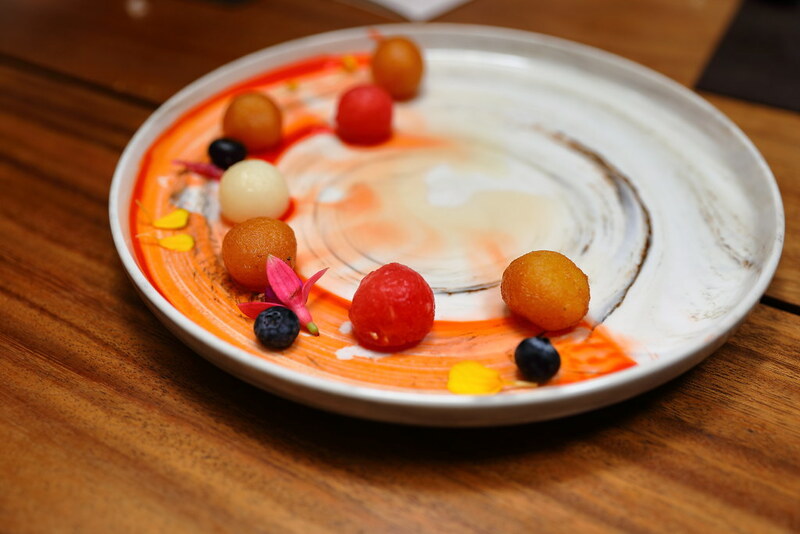 The gulab jamuns drenched in rose saffron nectar syrup is usually very sweet but this is toned down and balanced with generous portions of fresh fruits. 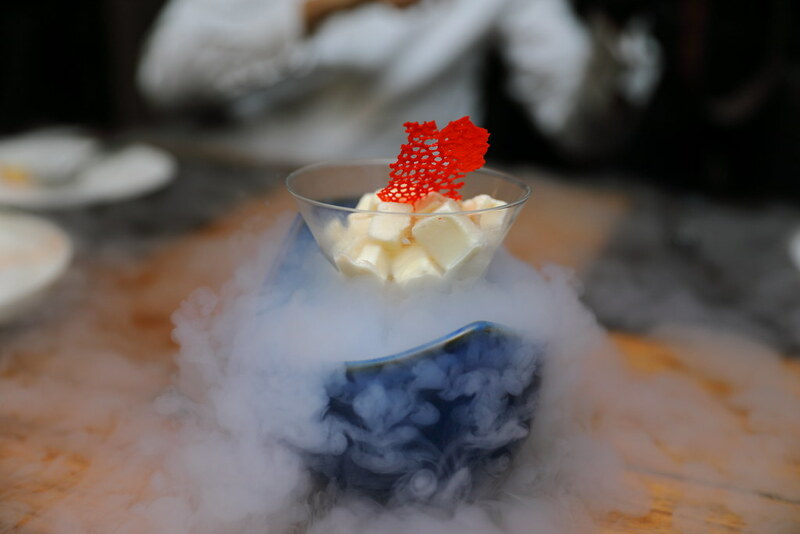 Made of natural ingredients, the Lychee Kulfi ($20), a traditional ice cream is very refreshing with surprises of fresh lychees within. 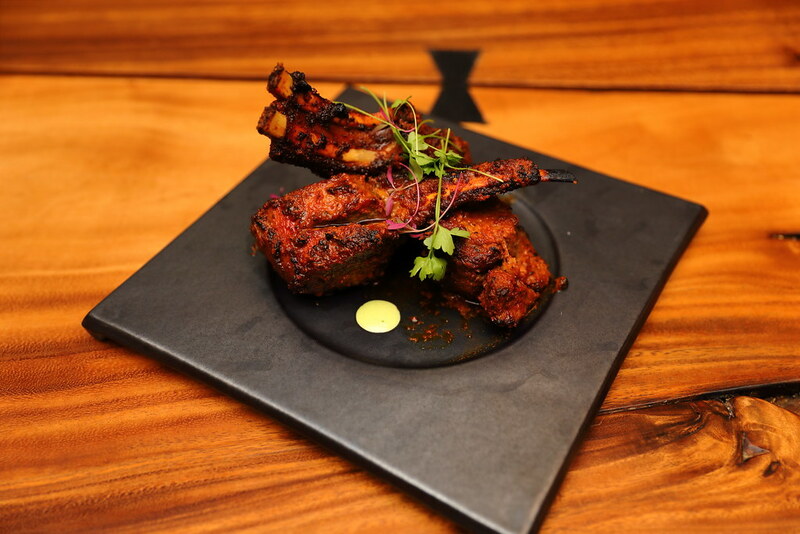 After dining at Rang Mahal, it definitely opens my eyes how Indian cuisine has evolved and given a modern touch to traditional homecooked, street and gourmet classics dishes.